From the outside, a company may look like “the place to work,” but constantly they are having to hire new personnel when their employees leave. The culture of the company may not actually align with their core values which make for an unhappy workplace. So how can this all be changed? Let’s first understand what a great culture is versus what it’s not. 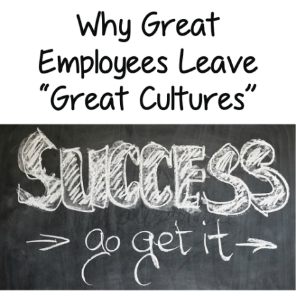 What is a Great Culture? While some might think having a great culture is all about parties or free gifts or company sponsored workout classes, having a great culture is so much more than that. When a company’s behaviors, systems, and practices all align with their core values, great culture is the largest by-product. A majority of employees leave great companies when gaps form between the three elements and core values. For example, if a company says they “promote from within”, but even the top performers in the company never get a promotion. To fix a failing culture, the best place to start is by reviewing the behaviors, systems, and practices in place to see where improveme nts can be made. Behaviors – Employees want to know exactly what behaviors will get a promotion or raise. When there are clear expectations, employees can focus on working on those behaviors to get ahead in their career rather than worrying if they are doing the correct things. mployees will become confused if what they need to do to get a promotion isn’t consistent with the behaviors of leaders already in place in the company. Systems – Every system that is in place in a company, such as job titles or technology used, can lead to a company’s culture excelling or declining. A few key systems that must be correctly working towards a better culture include assessments, rewarding, and goal setting. Assessments: Knowing how frequently assessments will be given and how feedback will be provided on them is important. Rewarding: Employees need to see there is a true system in place for gaining a promotion. They will lose trust and faith in a company when this is perceived as random. Goal Setting: Including employees in the goal-creating process will aid in clarifying expectations and guidelines. Practices – Practices, such as meetings, feedback sessions, or company events, must change as the company grows or faces setbacks. Evolution is the key to success when showing employees that the company is willing to work on maintaining a great culture.